Chemical storage buildings safely store chemicals and flammable materials. Different types of buildings are available depending on the fire-rating and certification required. But, what happens when you need a larger square footage unit placed in a small footprint site? Modular storage buildings for chemicals offer a solution. Because chemical storage buildings are pre-fabricated in the factory and transported to their site of use, there are logistical limitations on its size. The maximum transportable size on U.S. roads is 60 feet by 14 feet, but this is not always big enough. The California Department of Fish and Game ran into this exact problem. They needed a 324-square-foot building to house up to 144,000 pounds of virgin chemicals. Multiple smaller structures were not an option. U.S. Chemical Storage delivered a modular design in two halves. After anchoring the building to its foundation, installers sealed the units together and re-connected its electrical and other accessories. Modular storage buildings are also an alternative to expensive, time-consuming warehouse construction. A paint manufacturer needed to extend their warehouse space without interrupting their operation. U.S. Chemical Storage installed their extension in a single day. Trucks arrived on site with the modular units at 9 a.m. The units were in position by lunchtime and ready to use by the end of the day. 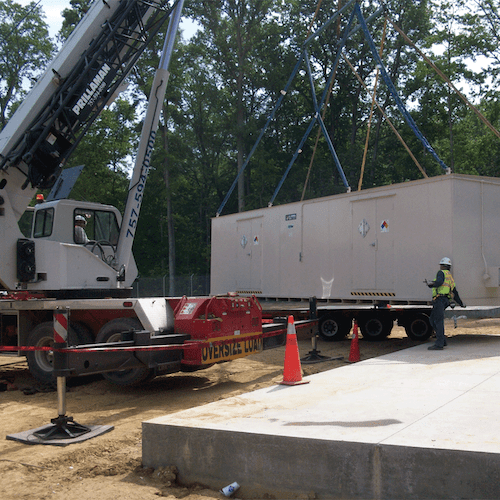 How Are Modular Storage Buildings Constructed and Installed? Fire-rated and non fire-rated chemical storage building models are available as modular constructions. U.S. Chemical Storage pays particular attention to the required accessories package. They manufacturer and assemble the complete modular unit at their facility. During this “dry run” process, climate control units and other accessories are also function tested. Some units need specific fire ratings or explosion proof designs. The factory installs these accessories to exacting specification and code requirements. This provides added assurance to the customer that the building is compliant. Once testing is complete, they separate the building into modules for transport to site. Clients must construct the base before the building arrives for rigging into position. Assembly crews bolt the modules together, using silicon caulk on all exterior joints, roof and walls. They seal interior joints including walls and ceilings with fire caulk. Qualified personnel reconnect electrical, fire suppression and alarm systems at the joins. They test all accessories again to ensure the storage building is ready for use. What Are the Advantages of Modular Storage Buildings for Chemicals? Modular chemical storage buildings allow for compartmentalization. Segregate chemicals using partition walls. This is important where there are compatibility issues that create safety risks. Partition walls can also be fire-rated for certification and compliance reasons. The walls match the depth of the building and run from sump to ceiling height. Operation costs may also be less. Using a single unit for heating, cooling and electrical equipment is much cheaper than using multiple small units. What Are Common Accessories for Modular Chemical Storage Buildings? Climate control is often necessary when storing chemicals. Certain chemicals become unstable outside their recommended storage range. Others, like paint, may degrade in quality or have a reduced shelf-life due to sub-optimum storage conditions. Climate control comes in the form of heaters, chillers or air-conditioning units. Automated control systems keep the temperature in the desired range. Flammable chemical storage requires intrinsically safe electrical equipment. This prevents electrical sparks from igniting a fire inside the storage building. Fire suppression systems automatically extinguish fires and fire alarms notify the relevant personnel. U.S. Chemical Storage supplies pre-fabricated modular chemical storage buildings to maximize limited square footage when managing hazardous materials. Solve your large volume storage needs with a quick and efficient installation process. Browse our range of chemical storage buildings here.